Every online marketer will agree that the key to success is conversions: More people clicking on your “Subscribe” or your “Buy Now” buttons equals more leads and sales. But when it comes to choosing a color for your buttons, well, that’s a highly debated topic. 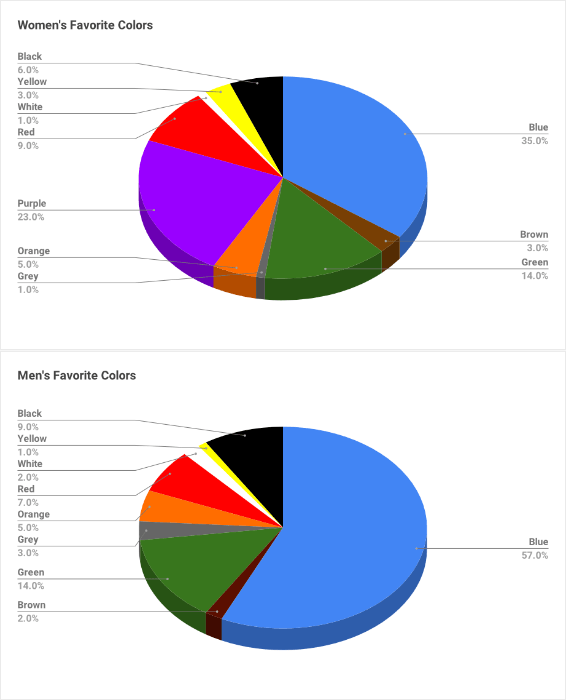 Can certain colors increase your conversion rate? In this article, we’ll look at what the research says is the best call to action button color. What Do the Conversion Experts Say? You may have heard a lot of conflicting advice surrounding conversion optimization, especially when it comes to color. Sure, we all know that urgency, social proof, clear design, and the right lead magnet can all help conversions. But color? That’s a tricky one. The Generalizers. This type of conversion rate optimizer will religiously commit to following general, broad best practices. However, they won’t dig deep into the psychology of their own customers to fine-tune their campaigns. The Pigeonholers. This second type swears by very specific strategies. They will tell you that there are certain “secrets” that are guaranteed to increase your conversion rate. They’ll tell you that a certain color, font or layout is the way to guarantee your success. The Perpetual Testers. The third type won’t commit to any strategy. These optimizers have experimented enough to know that some strategies don’t necessarily work for everyone. Instead, they’ll tell you to test out different things, almost at random, until you find something that works. The Generalizers will tell you that there are some general truths about color. Some colors work well for certain industries, and there are some colors that you should never use. The Pigeonholers will swear by one color that converts better than any of the others. The Perpetual Testers will say that color might make a difference, but not in any consistent or predictable way. Clearly, they can’t all be right. Perhaps color doesn’t play a significant role in conversions as we thought. Or perhaps there is something more subtle going on here? Does CTA Color Really Matter? Psychologically, there’s no doubt that color can have a profound effect on people. For instance, the color of a room can affect your mood. Red has been shown to raise blood pressure, increase the speed of respiration and quicken heart rate. Blue, on the other hand, has the opposite effect: it reduces blood pressure, slows down respiration and reduces heart rate. In one study by researchers at the University of British Columbia, blue was shown to improve creativity, whereas red was shown to increase memory and attention to detail. Due to these findings, it seems that marketers should be able to use the “psychology of color” to create more persuasive logos and branding materials. And many marketers have indeed attempted this. The above infographic from The Logo Company attempts to show a clear-cut relationship between color and the psychological impact that color has on how we perceive a brand. Restaurants, for example, have tried to use the color red in an attempt to stimulate feelings of hunger. For instance, does the color red actually stimulate appetite? The actual studies suggest that red actually inhibits appetite in humans, and it tends to inhibit behavior in general, kind of like a “stop” sign. Red does, however, stimulate feeding in Nile Tilapia fish. 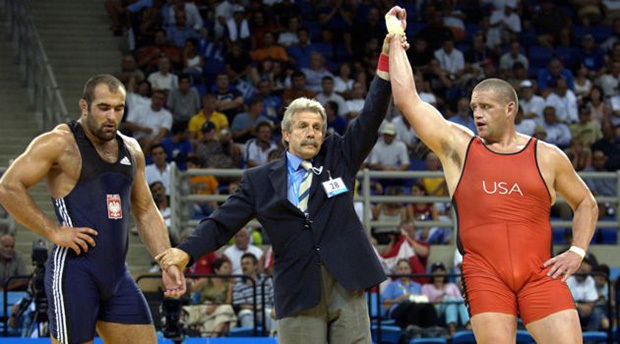 In a study on performance, Olympic wrestlers were randomly assigned blue or red uniforms. The wrestlers in red uniforms significantly out-performed their blue-suited counterparts, indicating that red may make you more aggressive or more competitive. But in another study in an academic environment, the presence of the color red actually inhibits performance. All of these results suggest that red can either make you a “winner” or a “loser” (or “hungry” or “not hungry”), depending on the context (and depending on whether you are a human or a fish). Let’s take the colors black and white, for example. In Western culture, black symbolizes funerals, death, and mourning. White is associated with brides, weddings, and purity. But in China, it’s quite the opposite: white is the symbol of death and mourning. Black is the color for young boys. So how are marketers supposed to make sense of all this? How can you leverage the psychological effects of color to get people to buy more of your stuff? It may seem theoretically possible to choose a “perfect” color: one that’s culturally and demographically appropriate for your buyer persona, and contextually appropriate for your brand. The problem is, there’s no clear way to prove this. Say you change the color of your call-to-action from blue to red, and you see an increase in conversions. Does this mean that red converts better than blue? You see, there is more at play here than just the color of the button itself. The variables include not only your brand and your audience, but also the surrounding design. It’s nearly impossible to isolate all of the variables and definitively prove which color converts best. Let’s put it another way. To first try and understand the way your buyer persona reacts to color, and then to develop a color-based conversion strategy around that, would be impractical at best. It would be very difficult, if not impossible, to nail down. You’d spend less effort and see similar results if you simply tried different colors, one at a time until you found one that outperformed the others. But that’s not what we are suggesting that you do. There is a much better way to approach this color issue, without having to throw stuff at the wall and see what sticks. If, for example, your button color is low-contrast against your background color, visibility will be poor. But, increase the contrast between the button color and the background color, and boom! Your conversions will go up. No understanding of context or psychological underpinnings necessary. (Image via Dribble. )The other factor to consider is the overall color scheme of your page. If one color dominates your page, and that color is also being used for your call-to-action, it won’t stand out. 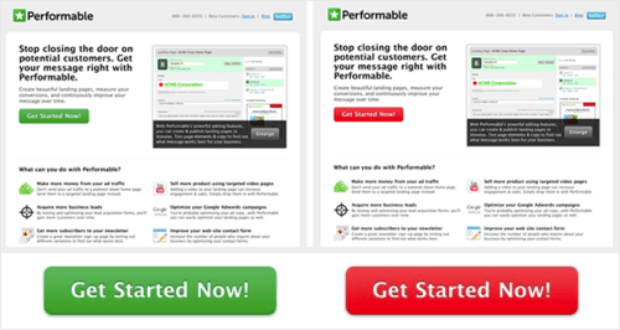 To make your call-to-action really pop, again choose a contrasting color. To get the most contrast, pick a complementary color: one that is opposite to your dominant color on the color wheel. Another high-contrast color is a triadic color: one that is a third of the way around the color wheel from your dominant color. We also know from studies that people perceive colors differently depending on how well those colors “match” your brand. Whether or not your brand personality in on point for your customers, and whether your colors are helping or hurting your brand’s perceived personality, actually affects purchase decisions. 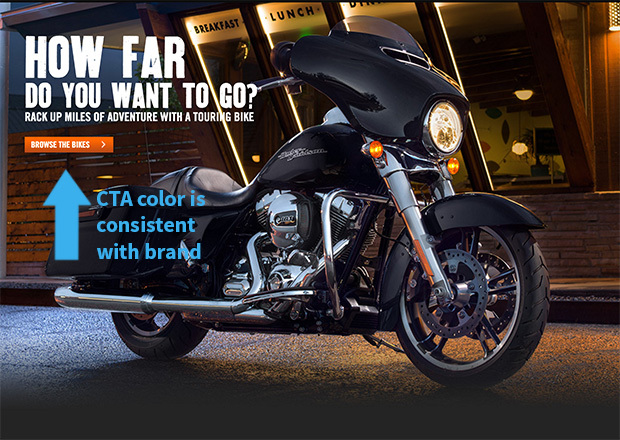 For instance, let’s say your brand is tough, rugged, and masculine… like Harley Davidson. Now imagine if they used pink call-to-action buttons instead of a big orange button. It wouldn’t quite work, would it? 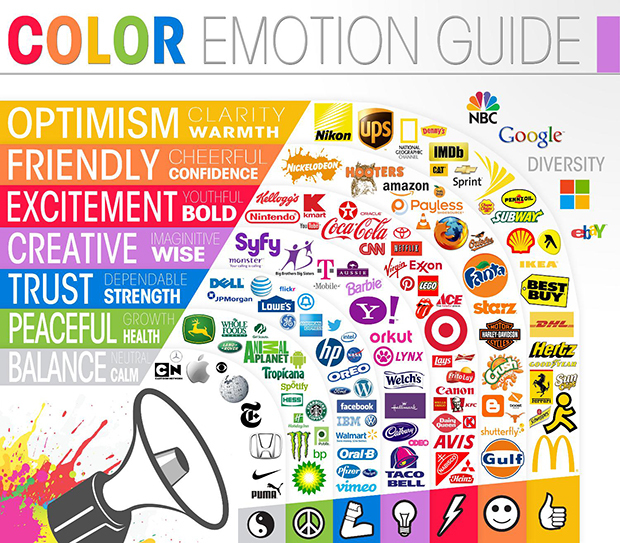 The other thing marketers know about colors is that we can control the meaning that our users associate with them. Remember those studies we mentioned earlier? How can the color red have a completely different impact depending on the context? The logical reason is because of the association that is created from that context. For instance, blue is the most commonly used color for hyperlinks. Therefore, most people associate the color blue with hyperlinks. They know that if the text on a page is blue, you can probably click on it. The same is true for call-to-action buttons. You don’t have to choose the color blue, but be aware that whatever color you assign to a button is now going to associated with action. Use this to your advantage by consistently using that color for all the calls-to-action on your site. Don’t confuse your users by using the same color for non-action items, such as headings that aren’t clickable. Similarly, don’t confuse your users by using a lot of different call-to-action colors on the same page. Consistency creates a good website user experience, which is critical for conversion rate optimization. It’s pretty much impossible to prove that any one color is better than any other color for persuading an audience. There are just too many variables, and too much conflicting evidence to come to any universal conclusion. So instead of trying to find the “perfect” color, go for the color that increases the visibility of your call-to-action. With this simple and proven approach, you can virtually guarantee an increase in conversions. If you’re looking for a surefire way to increase your conversion rate, a practical solution like OptinMonster is just the ticket. Rather than making guesses in the dark, OptinMonster will help you to improve your conversion rates with clearer analytics and easy A/B split testing. Click here to try OptinMonster and dramatically increase your website’s conversions. So which is the best call to action button color for you? Have you tested out different colors on your site? Let us know in the comments! Please correct the ‘Contrast’ spelling on the diagrams showing high and low contrast. Excellent foundation & finding in color selection. I liked your suggestion to colors. Thank you so much. Nicely done. Always good to see fresh articles on color theory especially in regard to conversion to put in my pocket. Thanks. I have been working to improve response rates to my landing page and was wondering if the color of the CTA button made a difference. Enjoyed the article, but can’t decide if my ‘brand’ would best be supported by a blue, red or green button. I am going all in on a green CTA for my next modification. You could always split test the options, Aldon. 🙂 That way you’ll know for sure. Interesting, I’ve been trying to wrap my head around this for a while. I run a blog for consumer tech, the predominant color is blue, I’ve used red buttons for the last two years, I switched to yellow a few days ago and saw a sharp decline in clicks but here’s the interesting part, while the clicks have declined in about 30-40% conversions seem to be up by 80%. Still pending on seeing how it evolves throughout the next few days but it’s clear that the color red generated more clicks (averaging 150% better clicks on some posts tested) yet the conversions of yellow seem to be better. My thoughts are that people associate yellow with e-commerce and buying and therefore when they “click” they already do so with intent of purchase whereas with the red button they didn’t know where they would land. Still testing it out though, let’s see how it performs in the next few weeks. Wish me luck! Well you guys went with the green and I figure you got far more data that’s been split tested than I ever could so BOOM! Optinmonster doesn’t seem to be concerned about accessibility when it comes to their colors, I would be interested in how this article would approach colors and accessibility on the web. Jessica, you’re right. We haven’t been super well-informed about accessibility in the past, but there have been a lot of conversations happening – not only in OptinMonster but in the larger Awesome Motive family. I hope these help! Thanks for this important question! Great read! Thanks 🙂 Helped me.